Workers and community members at the gate of Terminal 59, Port of Oakland, leased by SSA (a subsidiary of Carrix, Inc.). 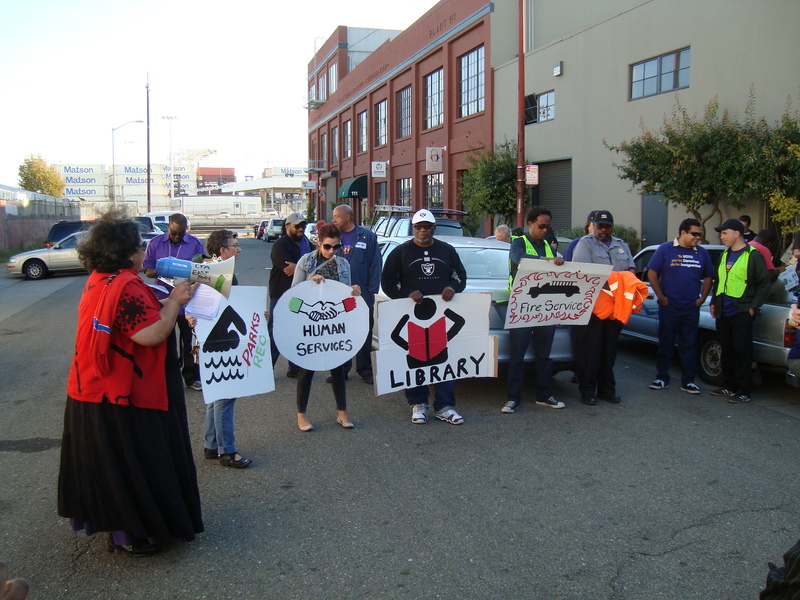 A coalition of port workers, including members of the unions SEIU 1021 and Unite HERE, and Oakland residents with the Coalition to Stop Goldman Sachs, plus organizers with Occupy Oakland, picketed the Port of Oakland yesterday. The picket line was “informational” only. Union leaders did not intend to ask other workers, including ILWU longshoremen to not cross the line, a move that would have disrupted a shift and brought operations to a halt. ILWU’s rank and file pride themselves on their solidarity with other unions and routinely do not cross picket lines. Instead, the workers and Oakland residents marching at the port, wanted to make a show of strength, demonstrating their ability to effectively shut a maritime terminal down if they feel the need to do so. They passed out information about their struggle against the Port’s management, and against the financial corporations they say profit from the Port’s current positions in labor negotiations. 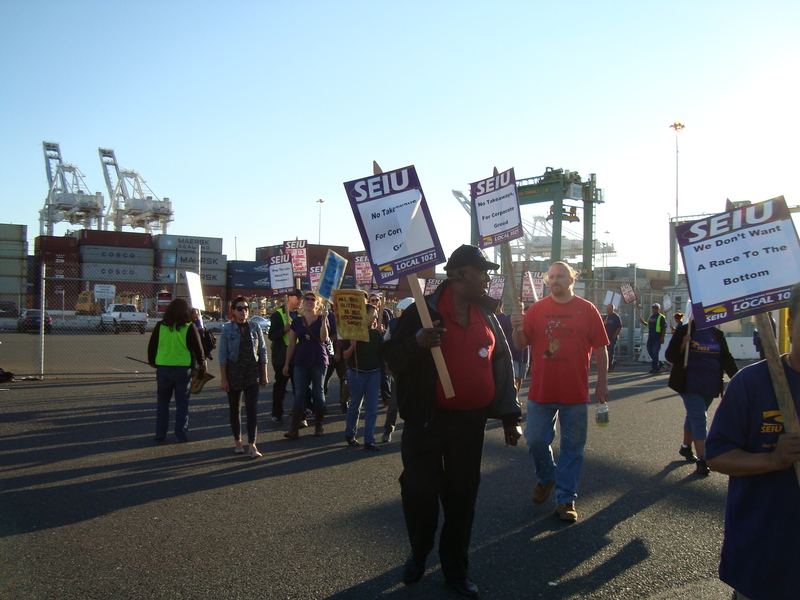 SEIU 1021’s port chapter is currently negotiating (along with three other unions) for a new contract that would include a 5 percent cost of living increase. The port’s management has countered that they will give no such increase, and furthermore that they seek increased employee contributions into their pensions. Port management hope to free up more revenue for increased capital investments that will benefit marine terminal operators, shipping companies, and real estate investors. The Coalition to Stop Goldman Sachs enacting a skit that explains how the interest rate swap has harmed the city’s finances, one of several reasons why city services have been cut in recent years. Also present at the informational picket were members of the Coalition to Stop Goldman Sachs, a community group that is pressuring city leaders and the bank to terminate a costly interest rate swap that has cost Oakland upwards of $20 million due to the divergence of interest rates following the financial crisis in 2008. Labor and the community have united around the port because both share an analysis of the major financial corporations that profit from the port’s debt, capital investments, and the trade that flows through the busy maritime and air terminals. Goldman Sachs was specifically singled out because the company owns a stake in the marine terminal operator SSA. SSA’s terminal at the port, Berths 57-59 were the site of the picket. The Oakland International Container Terminal, operated by SSA. 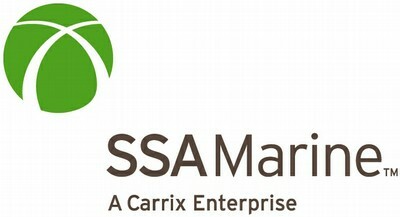 SSA is owned by Carrix, Inc., a Seattle-based corporation. 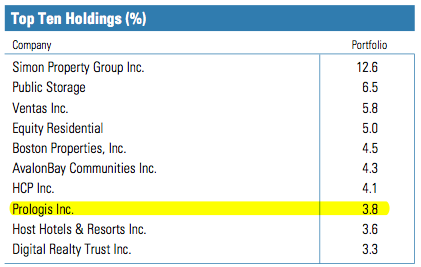 Goldman Sachs owns 49 percent of Carrix. Goldman Sachs has multiple longstanding interests in the Port of Oakland’s finances and business operations. Goldman Sachs is a party to at least three major areas of Port business. First and foremost is Goldman’s role as an underwriter or dealer for the Port’s various debt offerings. No other financial company is as important as Goldman Sachs for the Port’s numerous and complex bond and commercial paper deals. Goldman Sachs also holds a financial interest in the Port’s day-to-day operations. Through several Goldman Sachs investment funds the bank holds ownership stakes in major shipping and logistics corporations that lease Port facilities, or otherwise conduct business through the Port of Oakland. Finally, Goldman Sachs has attempted to involve itself in the Port’s real estate development activities by teaming up with developers who hold options on waterfront real estate. Goldman Sachs is among a handful of financial companies pre-qualified by the Port of Oakland to deal its commercial paper. This image is taken from a recent Port of Oakland board meeting agenda. For several decades now Goldman Sachs has routinely been selected, along with a handful of other privileged banks, to serve as a pre-qualified dealer for various types of debt offerings issued by the Port. For the Port’s Capital Improvement Program, Goldman Sachs has been selected to underwrite or deal in multiple major debt offerings. For example, in 2000 Goldman Sachs led a syndicate of investment banks to underwrite $400 million in bonds to finance major expansion at the Oakland Airport. In 2002 Goldman Sachs again led an offering of $620 million in bonds to finance aviation capital projects, as well as construction of new shipping terminals, intermodal facilities, and dredging at the Port. Goldman Sachs remains one of the Port’s key dealers for commercial paper today. The bank makes millions off this business by re-selling the Port’s commercial paper to investors in the open market at higher prices, as well as by charging a dealer’s fee. Senior level executives who have worked for both the Port and Goldman Sachs at different times strengthen the bank’s close business relationship with the Port. The Port’s current CFO, Sara Lee, is a former Goldman Sachs vice president who led the bank’s public sector and infrastructure finance group. This group has its offices in Goldman Sachs’ San Francisco branch headquarters at 555 California Street. Goldman Sachs has tended to appoint politically connected individuals to lead its public sector and infrastructure finance group and other divisions. 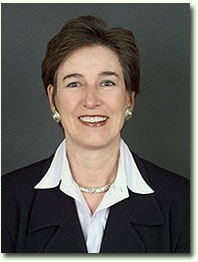 Among its recent senior executives in California were Kathleen Brown and Jeffrey Holt. Kathleen Brown, the sister of current California Governor Jerry Brown, was State Treasurer from 1991 to 1995, overseeing California’s finances that are a source of immense profits for the investment banking sector. In 2001 she joined Goldman Sachs, working in its San Francisco office as a private wealth adviser. From 2003 to 2011 Brown headed Goldman Sachs’ public finance and infrastructure finance group in California. During this same period (1999-2007) Jerry Brown was the Mayor of Oakland and had considerable influence over the operations of the Port through his appointments and policies. Upon her brother’s election to the governor’s office she was transferred to Chicago to avoid the “perception of a conflict of interest,” as one Goldman spokesperson said at the time. Jeffrey Holt worked in the San Francisco offices of Goldman Sachs alongside Brown and focused on financing West Coast ports, among other business lines. Upon leaving Goldman in 2008 Holt became a managing director at the Bank of Montreal, and chairman of the Utah Transportation Commission. Holt is still active in arranging private financing for ports and is considered an expert on privatization of infrastructure through specialized private equity funds such as the one he oversaw at Goldman Sachs. A slide drawn from Jeffrey Holt’s presentation “Attracting Private Sector Investment in Public Ports,” given at the American Association of Port Authorities conference last year in Portland, Oregon. Holt says the privatization of Oakland’s Berths 20-24 by Ports America (owned by the Highstar Capital private equity group) is a successful example of the new trend in port finance. Holt is currently a member of the Carlyle Infrastructure Partners (CIP) management team. Holt’s biography in a recent CIP document says that while with Goldman Sachs he provided “advisory services associated with acquisitions include the purchase of a minority stake in Carrix Inc., an international terminal operator,” and that he also “[assisted] Highstar Capital and its Ports America team on several terminal acquisitions.” The latter is probably a reference to the Ports America $700 million 50-year concession at the Port of Oakland that replaced APM Terminals and other comapnies as the operator of Berths 20-26, among the busiest and most valuable operations at the Port. Through its infrastructure group, and its asset management division, Goldman Sachs holds significant equity stakes in numerous shipping and infrastructure companies. Several are active at the Port or Oakland, further linking the investment bank’s profits to the Port’s operations. Goldman Sachs’s infrastructure group owns 49 percent of the privately held Carrix, Inc. Based in Seattle, Carrix owns SSA Marine, one of the largest US port terminal operators. 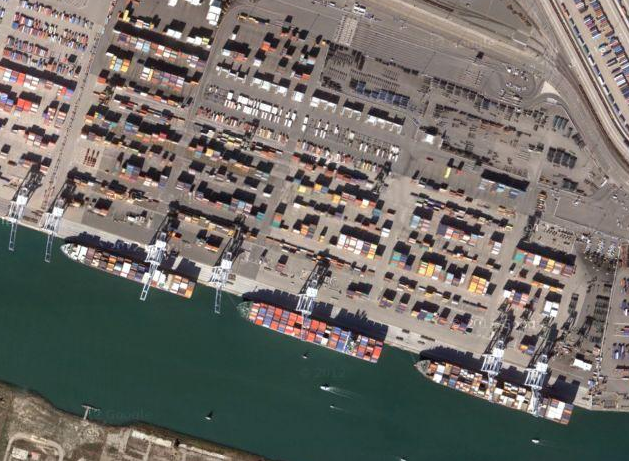 SSA operates the Oakland International Container Terminal (Berths 57-59) and the Charles P. Howard Terminal near Jack London Square. When Goldman’s minority purchase of nearly half of Carrix was completed in 2007 the Financial Times observed that, “the sale of the stake in Carrix is at least the ninth significant deal in the past year in which ownership of stakes in US port assets has transferred from specialist transport companies to a new breed of funds investing in infrastructure.” Goldman Sachs is a leader among financial corporations that have moved to take control over transportation infrastructure, especially ports, in recent years. Asset management at Goldman Sachs, as well as other major investment banks, is a service offered to wealthy families and institutions whereby the bank manages money to attempt to produce a return on value that beats the market, or at least outpaces inflation. In return for their services to these wealthy families and institutions, Goldman often charges a management fee and takes a percentage of profits made through these investments. To be a client of Goldman Sachs asset management you must have tens of millions of dollars to invest through its various funds. Kathleen Brown worked in this area for several years before becoming the head of Goldman’s public finance and infrastructure group. At least one Goldman Sachs asset management fund is invested in the stocks of corporations that do business at the port. The Goldman Sachs Structured Intl Equity A fund owns a small number of shares in the AP Moller-Maersk corporation which is the parent company of APM Terminals. Until recently APM Terminals operated Berth 24 at the Port with three cranes and was one of the Port’s larger grossing operations. AP Moller-Maersk still imports through Oakland as one of the major servicing lines. Through the same Goldman Sachs Structured Intl Equity A fund, Goldman Sachs owns a small stake in Kawasaki Kisen Kaisha, Ltd., also known as K-Lines, a major shipping company that imports through the Port. K-Lines owns International Transportation Service, a company that was the fifth largest revenue generator for the Port in 2010 and 2011 according to the Port’s most recent CAFR. An excerpt from a recent Goldman Sachs Real Estate Securities Fund report shows a significant equity investment in Prologis. 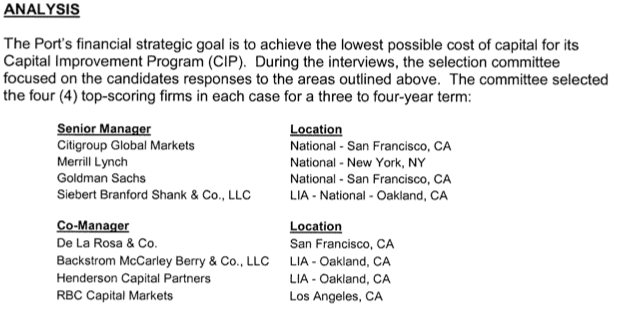 Goldman’s sources of profit deriving from the Port of Oakland don’t stop there. According to a report from the Goldman Sachs Real Estate Securities Fund, an investment vehicle that focuses on the stocks of real estate companies, Goldman Sachs owns a significant stake in Prologis. Prologis is one of the developers of the planned logistics facility that will be built on the former Oakland Army base. Prologis also owns a warehouse near the Oakland Airport used in airfreight shipping. Goldman Sachs reports that it recently “trimmed” its position because of the company’s stock value decline, however the bank still has around 3.7 percent of its Real Estate Securities Fund invested in Prologis, making it a top 10 investment. In other words, Goldman Sachs is stands to doubly profiting by dealing the Port’s commercial paper. The first profit comes from the spread earned by acting as dealer. The second source of profit will be derived from the improved infrastructure that will be used by companies such as Prologis, AP Moller-Maersk, and K-Lines, which the bank owns small equity stakes in, or from the Oak to 9th project. Developer’s rendering of the Oak to 9th project. Rounding out Goldman Sachs’ nearly ubiquitous presence in the Port’s finances and operations is a proposal that allows Goldman Sachs to participate in the redevelopment of Oakland’s waterfront. 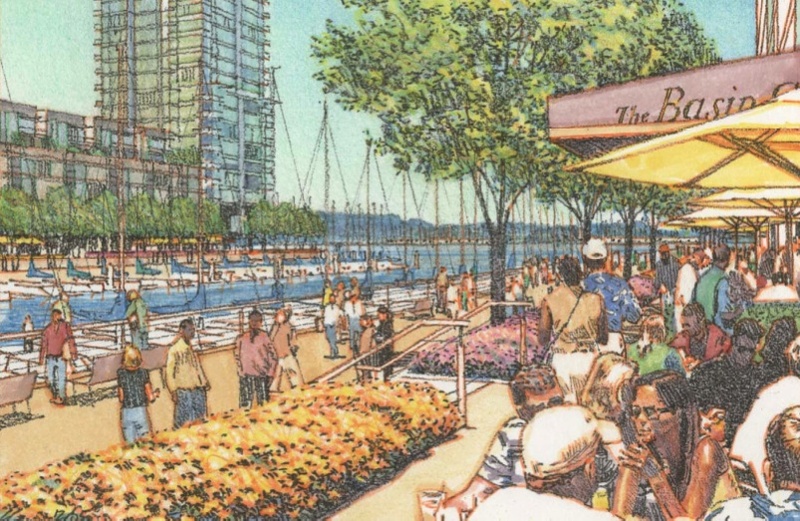 The Oak to 9th project, ostensibly led by Bay Area-based developers incorporated as Oakland Harbor Partners LLC, involves building housing, retail, and parks on large land holdings owned by the Port.